A lot of attention has been paid to the drop in oil prices to $28 per barrel as of today which is indicative of the increase in supply from US shale producers and the fall in global demand especially from China. However there is another indicator that shows the global economy is in pause mode and that is the Baltic Dry Index which measures the cost of shipping raw materials – iron ore, coal, metal etc. In mid January this year the index fell below 400 (see graph) for the first time since records began in1985. In June 2015 the index was comfortably above the 1000 mark and in 2010 approximately 4000, therefore transport costs are at a very low level. Why are shipping costs at such low levels? It comes down to simple supply and demand. On the supply side shipping companies have increased their dry bulk capacity as the cost of borrowing money is at very low levels. On the demand side it was assumed that global trade would keep expanding but according to a World Bank report global trade has slowed down sharply in recent years to around 3% and it predicted to slow further. Owners of the largest container ships (known as capsize vessels) reckon it costs $8,000 per day for running costs. However in today’s market, users of these ships only pay around $5,000 in fees which makes it uneconomical for ship owners to offer their service. With this is mind shipping bankruptcies are bound to feature this year and unless China produces a new growth spurt the Baltic Dry Index will keep heading south. This entry was posted in Growth, Trade, Transport and tagged Baltic Dry Index on January 19, 2016 by Mark. Listening to “From Our Own Correspondent” on the BBC World Service I came across an interesting piece by Kate Adie on Global Trade. With the downturn in global trade the international transport industry has been very much affected. Those that have been associated with the distribution of goods get an early indication of the slowdown in global growth. The obvious indicators are: idle cranes, queues of merchant ships dwindle etc. But what about the speed of cargo ships and the length of ladders to climb aboard? When the world economy was “steaming” ahead the captain of a merchant ship said that they cruised at 20 knots but when the economic crisis of 2008 arrived we slowed to 16 knots. 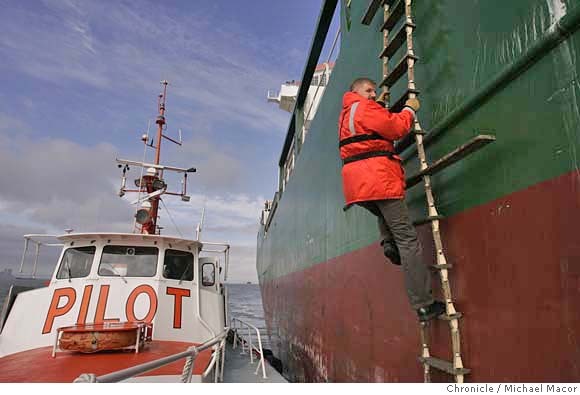 A harbour pilot summed up the state of world trade by the length of the ladders that he climbs on the sides of ships. A long climb up the ladder signifies that the ship is high in the water and exports are correspondingly low. A short climb up the ladder signifies that the ship is low in the water and exports are correspondingly high. The seafarers say that they take air to China before they load up with goods for the US. This entry was posted in Growth, Trade, Transport and tagged Eco Indicators on September 22, 2014 by Mark. The New Zealand Parliamentary Library “Monthly Economic Review” published a feature on taxes and levies on petrol. Taxes and levies on a litre of petrol in New Zealand account for approximately 43 percent of the overall price. – $766 million on petroleum imports. The following diagram shows the taxes and levies on a litre of petrol (including GST). This entry was posted in Transport and tagged Oil, Tax on August 17, 2014 by Mark. * Port authorities inspect less than 10% of boxes, making them of great interest to counterfeiters and drug barons. This entry was posted in Trade, Transport and tagged Container Ships, Globalisation on December 5, 2013 by Mark. BBC business correspondent Alastair Fee boards a Chinese container ship off the coast of England and reports on the enormous size of it – holds 13,500 containers. And they are getter bigger. More than 40% of the UK’s sea trade comes into the Southampton Dock and to meet increasing demand from container ships a new 500 metre birth is being dredged. However trade goes the other way as in 2012 the demand for cars from the growing Chinese middle class saw over 20,000 BMW Minis make their way to Chinese ports. This entry was posted in Trade, Transport and tagged China, Container Ships, UK economy on October 21, 2013 by Mark. Some alarming figures have been banded about with regard to America’s infrastructure. It is estimated that over 700,000 bridges are rated as structurally deficient. In 2009 Americans lost approximately $78 billion to traffic delays – inefficient use of time and petrol costs. Also crashes which to a large extent have been caused by road conditions, cost a further $230 billion. Investment in infrastructure has a lot of positive externalities – faster traveling time for consumers and companies, spending less time on maintenance. Research has shown that the completion of a road led to an increase in economic activity between 3 and 8 times bigger than it initial outlay with eight years after its completion. But what must be considered is that now is the best time to invest in infrastructure as it is very cheap – much cheaper than it will be when the economy is going through a boom period. This entry was posted in Economic Cycle, Growth, Transport, Unemployment and tagged Infrastructure, Keynesian Policy, Multiplier, USA on April 17, 2013 by Mark. Last week saw Chinese officials indicating that Chinese airlines will not buy European airplanes as long as the EU insists on including foreign airlines in its emission trading system. Orders of 35 Airbus A330 planes have been cancelled and another 10 A380’s were in danger of being cancelled because of the ETS. The Chinese argument is that it is not reasonable to charge Chinese airlines taxes at the same time that the plane is made in Europe. China currently buys more than 1 in 5 Airbus planes being produced and the total of Chinese orders amounts to US$9bn. Therefore one could say that the future of Airbus hinges on the ETS. This raises the question of climate change and what are the options that countries face. The initial impression from the discussions over climate change is that of a typical Prisoner’s Dilemma and some of the data provided in the Stern Review (2006) can be used to populate the payoff table. –The cost of tackling climate change is approximately 1% of annual per capita GDP. However, if nothing is done about the issue the cost is estimated to be between 5% to 20% of GDP. So that defines what happens at the extreme of cooperative or non-cooperative behaviour. From the table above, a country that refuses to act, whilst the other cooperates, will experience a free-rider benefit – enjoying the advantage of limited climate change without the cost. On the flip side, any country that imposes limits, when its competitors do not, incurs not just the cost of limiting its own emissions, but also a further cost in terms of reduced competitiveness – estimated here at an additional 3.0%. From the table it seems predictable that countries should prefer to be self-interested: the best national policy, if others reduce emissions, is to defect; likewise, if other countries are not taking action, then it is pointless to be the only sucker to take action, and one should again defect. 1. Be Nice – sign up to unilateral cuts in emissions, as deep as your economy and financing capacity allows. 2. Be Retaliatory – single out countries that have not commenced action and, in collaboration, find ways of pressurising them until they do so. 3. Be Forgiving– when non-compliant countries come onboard give them generous applause; signal that good behaviour will be rewarded with even deeper cuts in your own emissions. 4. Be Clear – let everyone know in advance exactly how you are going to behave – that you will work with them if they take action on emissions, and that you will retaliate if they do not. It is the belief of Michael Liebreich that this research by Axelrod should be put into practice by the world’s climate negotiators. As treaties on climate change are on-going and therefore become part of the game. This entry was posted in Behavioural Economics, Externalities, Growth, Transport and tagged ETS, Game Theory, Prisoner's Dilemma on March 16, 2012 by Mark. Economies of Scale – Sending a T Shirt from China to Europe for 2.5 cents. The Economist had interesting piece on the economics of very big ships. If you wanted a good example of economies of scale look no further than sending a T shirt from China to Europe – 2.5cents is the cost. What allows it to be so cheap is the enormous scale of the new container ships that are now being produced – mainly in South Korea. Maersk container ships transport a considerable percent of the world’s ocean freight and they have a fleet of over 500 container ships that sail every major trade lane. The big ships are 400m long and the ship can carry 7,500 40ft containers each of which can hold 70,000 T shirts – that makes a total of 525,000,000 T Shirts per container ship. Furthermore it only takes 3 weeks for the T shirts to arrive in Europe and the combination of the largest combustion engine ever built and a minimum crew of 13 personel to run the ship leads to signifiacnt economies of scale (see graph below – Point A being the lowest point on the long-run average cost curve LAC). According to The Economist shippers will seek economies of scale not only from bigger ships but also from mergers. This entry was posted in Market Structures, Transport and tagged Economies of Scale on November 21, 2011 by Mark.